Stainless steel is now used extensively across both the commercial and domestic markets as it has such a wide variety of applications. Within the kitchen market it is now the most popular material in the manufacturing of appliances and sinks. Following its success in the catering industry, it was only a matter of time before it filtered into the domestic scene. 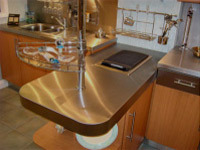 It provides a durable and incredibly hygienic work surface which is also resistant to heat. You may be worried about it scratching easily but it actually looks more natural once it has been scratched evenly all over! 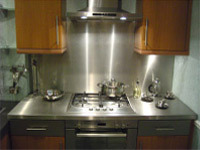 On the one hand the appearance of stainless steel has become one of its main assets. Many clients even opt to have some of their door and drawer fronts and occasionally their unit plinths installed in stainless. This promotes that slightly crisper or more clinical look and can prevent the furniture doors from becoming too dominant within the overall design effect. On the other hand you do have to be prepared to keep it polished to really benefit from its reflective sheen. In addition, some clients feel that there is enough stainless in the room by the time you include a sink, appliances or a stainless steel splashback behind a hob. 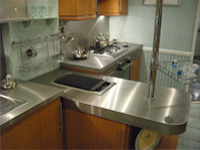 Stainless steel worktops are templated and manufactured by specialists. As a result it comes in various thicknesses (normally 40mm), can be curved in certain instances and can be specified with full height splashbacks. It's not for everybody but if you would like a lasting worktop that provides a reflective design statement its worth considering.